Saint Benedict wrote, “Do not grant newcomers to the monastic life an easy entry, but, as the Apostle says, Test the spirits to see if they are from God (1 John 4:1)”. Our policy at Kristo Buase is to let at least one year pass between a first request to join the community and the formal submission of an application. During that time the aspirant is expected to pay three visits to the monastery to experience at first hand the nature of our life. The first is for one or two weeks, the second for a month, the third for three months. The community will refund the travel costs of those we invite back in this way after the initial visit. Aspirants join the community for all of the liturgy, meals, the morning work period and Lectio Divina, but otherwise live as ordinary guests. The aspirant and novice master would together use this time to discern whether God is truly calling him to be a monk in this community. At the end of this year, if the signs seemed to be favourable and the aspirant persisted in his request, he would be asked to provide testimonials from his parish priest and others in positions of responsibility who know him well. A medical examination may also be arranged at Holy Family Hospital, Techiman, at the monastery’s expense. The first stage in formation is as a POSTULANT for one year. The emphasis here is on basic spiritual, rather than academic, formation. There will be classes in English, Christian Doctrine and monastic subjects, but the main ‘lessons’ of the year will be the practical ones of forming habits of prayer, silence, and adapting to community life. Then come two years as a NOVICE, at the beginning of which the postulant is clothed in the Benedictine habit. There will be classes on the Rule of St Benedict, Scripture and Monastic History, and the novice will also be expected to work on his own to become thoroughly familiar with the psalms, as these form the heart of our prayer. At any point in these first three years the postulant, or novice, is free to leave, or can be sent away if found to be unsatisfactory. It is only by taking the three vows of STABILITY, CONVERSION OF LIFE and OBEDIENCE that a man finally consecrates his life to God as a Benedictine monk. These vows are taken initially for a period of three years, during which the monk is described as a JUNIOR. Formation at this stage will be organised in conjunction with our monasteries in Great Britain. At the end of these three years the monk is free either to return to secular life or to request to make a permanent commitment to monastic life here at Kristo Buase through SOLEMN VOWS. The vow of stability binds the monk to a particular monastery and he will usually spend his entire monastic life in the same community. The total period of formation therefore lasts six years. Some monks will go on further with studies for the priesthood, but please note that the decision will only be made after the monk has made his solemn vows. We can give no assurance at time of entry that any particular candidate will be ordained. Monastic life, of itself, is neither clerical nor lay, and priests are ordained only as the needs of the community demand. Priests are needed for the celebration of Mass, for the hearing of confessions, and for some limited pastoral work with guests and local villagers, but if a candidate felt a very strong calling to the priesthood – such that he wouldn’t want to make solemn profession without being sure ordination was to follow – we would usually take that as a sign that his vocation lay with a more active religious order. This is one of the issues we would seek to address during the aspirant year. 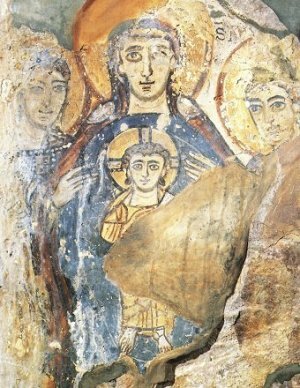 Picture above: a 7th Century painting of the Virgin and Child from the cave of the Shepherds in Subiaco. Mary has a special place in the spiritual life of a monk. She pondered on the Word of God in her heart. Mary is a model of the contemplative life. Candidates should normally be at least 21, and under 30, years of age, communicant members of the Catholic Church, and both baptised and confirmed. A monastic vocation requires special personal qualities. We look for psychological balance, the ability to relate well with other members of the community, the capacity for hard work without constant supervision, and – through all of this – a clear sign that the man is called to a life of prayer within the enclosure of the monastery. Our academic requirements are for the successful completion of SHS, with five passes including credits in English Language and Maths, alternatively technical qualifications (e.g. City and Guilds Certificates) supported by relevant work experience. To be considered for the monastic priesthood a candidate would need to possess at time of entry sufficiently high SHS grades to qualify him for tertiary education or the seminary.